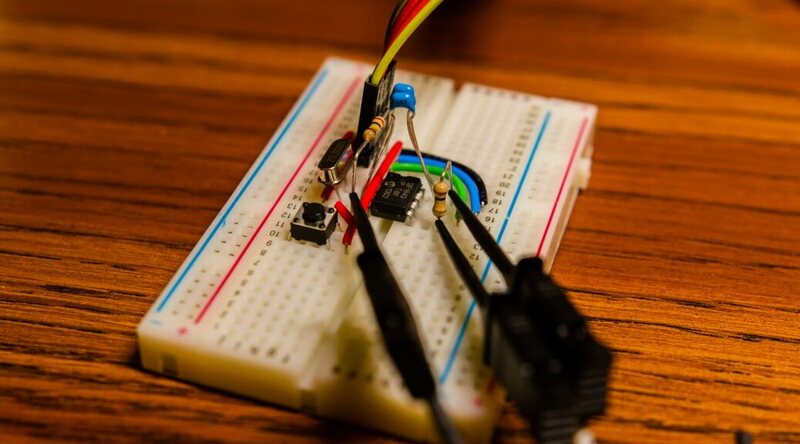 As a bit of a background, the plan was to make a ultrasonic transmitter that could extend upon the functionality of the commonly used SMT6500 ranging modules. The input to the driver is fairly simple: on a rising edge from the INIT input, the module sends out 16 pulses at 49.4 kHz to the electrostatic transducers. While this works great for ranging with single modules, it becomes problematic when you try to use several modules simultaneously as it becomes impossible to discern between the individual transmitters. A possible solution is to allow each transmitter to send its own unique pulse pattern, allowing for the different transmitters to be discerned with a bit of signal processing on the receiver side. The microcontroller of choice, a PIC12F1840, was chosen for two reason. The first is because I wanted a microcontroller with a small footprint and this one fits that requirement with only eight pins. Two of the pins are for power and ground, another two are allocated to the UART (for on-the-fly configuration), two more are used for the external crystal oscillator, one is used for the input, and one is used for the pulse output. The second reason was because I already have a decent bit of experience working with this particular microcontroller as I used it for my NeoPixel clock project. A 20 MHz crystal oscillator is used to drive the microcontroller. I decided to use an external crystal to allow for higher timing accuracy as the internal oscillator can vary by as much as 1%. Using an external crystal also allowed me to run the PIC at a frequency unachievable from using only the internal oscillator block. This is important as it allowed me to drive the output PWM from 20 kHz to 200 kHz without changing the timer configuration. With the PIC being driven at 20 MHz Fosc, the instruction clock is derived to be Fosc/4 or 5 MHz. The timer that drives the internal PWM peripheral is eight bits in size, resulting in a minimum PWM frequency of 5 MHz / 256 = 19.5 kHz with a 1:1 prescaler on the timer. Lower frequencies can be achieved by using a higher prescaler value at a loss of frequency granularity. 16 pulses (0xAAAA) at 50 kHz with 80% duty cycle for high bits and 20% duty cycle for low bits. The disassembly for the transmission of each bit is shown below. According to the instruction set table, it takes 22 instructions cycles to execute the code for determining and setting the duty cycle value for each bit. Thus a minimum of 23 instruction cycles is needed before TMR2 is allowed to match PR2, leading to a maximum PWM frequency of 217.4 kHz at a Fosc of 20 MHz. If the two LSB of the duty cycle register (DC1B) is ignored, a minimum number of 14 instructions cycles is required for each bit. This corresponds to a maximum frequency of 333.3 kHz at 20 Mhz. Due to use limited resolution of TMR2, the gap between achievable frequencies increases inversely with PR2. Thus the accuracy of the PWM frequency is higher at slower speeds. I’m fairly satisfied with the code base as it is, but I may add more features and/or speed optimizations later on. My next step is to build a custom PCB board that combines this microcontroller with the driving circuitry for the electrostatic transducers. I’ll be posting updates here as usual.